Professional Food Science Book from C.H.I.P.S. 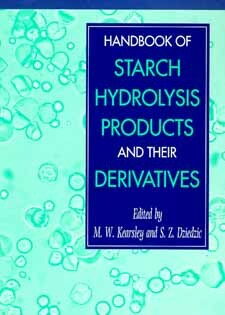 This book covers all aspects of starch production, from its hydrolysis to the analysis of the finished product. In addition, the most important derivatives of starch hydrolysis products are described and their applications in the food and, increasingly, pharmaceutical industries are detailed. The Technology of Starch Production: Glucose syrups. Starch. Industrial starch recovery. Enzymatic Production of Glucose Syrups: Enzymes for Starch Modification. Processing and Enzymology. The future. Maltodextrins: Maltodextrin production. Properties of maltodextrins. Analysis of maltodextrins. Applications of maltodextrins in food and related areas. Maltodextrin fat replacers. Specific examples of maltodextrin food applications. Cyclodextrins. Analysis of Glucose Syrups: Traditional physical and chemical analyses. Determination using chromatographic methods. Physical and Chemical Properties of Glucose Syrups: Dextrose equivalent. Degree of polymerization. Characterization of glucose syrups. Baumé. Bodying agent. Brix. Boiling point elevation and freezing point depression. Carbohydrate composition. Color formation. Fermentability. Foam development and stabilization. Glaze formation. Humectancy. Hygroscopicity. Molecular weight and DE. Nutritive solids. Osmotic pressure and water activity. Prevention of crystallization. Refractive index. Solubility. Specific heat. Specific rotation. Sweetness. Viscosity. Polyols from Starch: Polyols and their legal status. General points in the method of manufacture. Physical and chemical properties of polyols. Organoleptic properties of polyols. Nutritional aspects of polyols. Applications of polyols. Physiology, Metabolism and Tolerance of Digestible and Low-Digestible Carbohydrates: Carbohydrate digestion. Low digestible carbohydrates. Intestinal fermentation and tolerance. Use of low digestible carbohydrates in confectionery products. Glucose Syrups in the Fermentation Industries: Production of food ingredients and additives. Use of syrups in brewing. Use of Glucose Syrups in the Food Industry: Properties of Glucose Syrups. Confectionery. Dextrose monohydrate in sugar confectionery. Dextrose applications in sugar confectionery. Preserves. Ice cream and frozen desserts. Bakery products. Glucose syrup in savory sauces, tomato sauces and salad dressings. Coffee whiteners. Dried glucose syrup of maltodextrins.